As i noticed, grass is almost always done by 'hair' particle system. In cycles, for now, this ain't gonna work. Now, there is an alternative, instead of hair go with emitter (it worked for me). 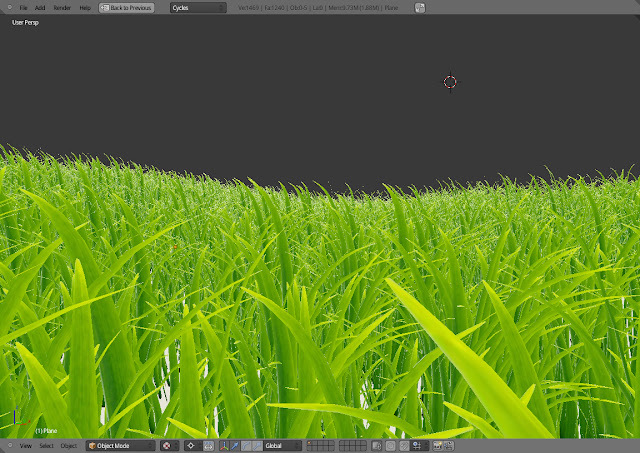 Of course, this type of grass can be used in other render engines. And i think that this is a better way to achieve realism. Really simple actually. You start with one simple stalk, and one simple stalk texture, and do UV stuff that goes with it. Then, duplicate that stalk few times, and do some variations with all of them. Now, create one plane, and apply particle system. Within emission parameter, set number of copies. If you are rendering frame 1, set start to -5 and end to -4. Lifetime... just put some big number. Display - if your computer is slow, reduce diplay number. 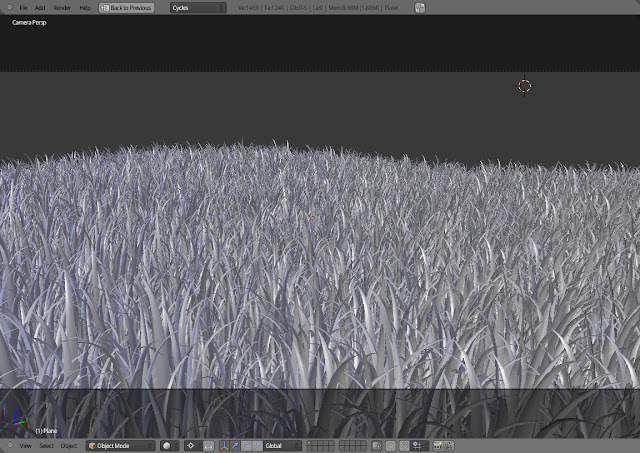 In render settings, choose object and instead of particles select your group of stalks. In physics, set it to NO, size to 1, random size to 0.500. It should be like in an image below. ...aaaaand i put same grass material, really basic. That's it. I hope you'll find this useful! I'll upload video tutorial of this in a next few days (if this is a little confusing). Now you can watch video tutorial as well. You can watch tutorial here or on youtube. Very useful tutorial mate, but the grass is more to desert plants than grass. too thick is what I meant. 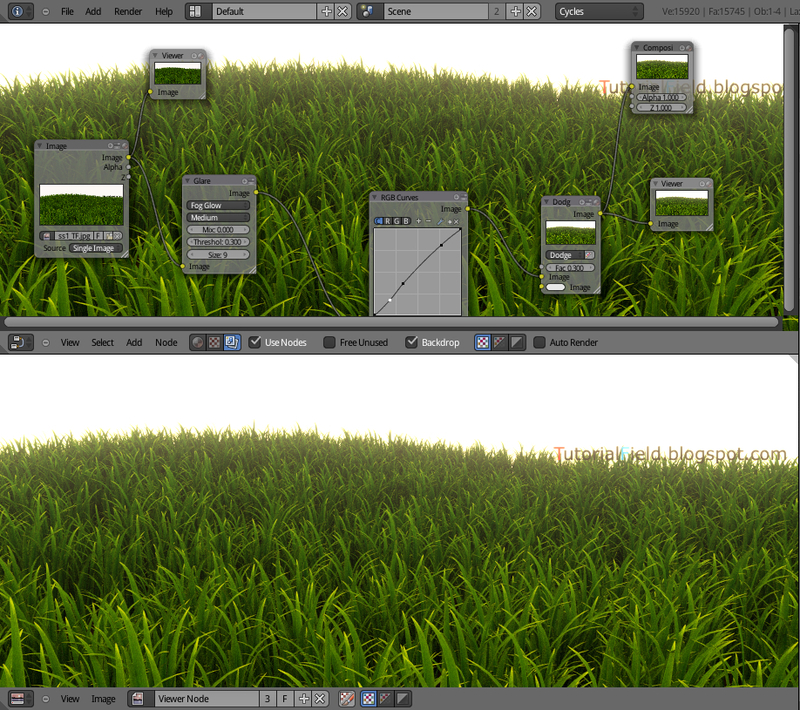 I know that grass is thick, i did it just to make tutorial more clearer. I have video tutorial of this that i'm going to upload soon, i'm busy these days so i can't earlier. I should mention that i'm preparing series of interior tutorials, in first series internal render is used, than i'm planing same thing with lux render and maybe cycles. Hi, I've found some usefull ideas discovered in Cycles via nodes here on this site, could You cover some tutorial about using Volumes in Cycles? I mean in materials but also in 'World' panel. Hi Pablo, i'll take a look in that too, i'm preparing a lot of tutorials, mostly covering designers needs, but i'm very busy at the moment, so unfortunately, for now, i can do very little for this blog. But i wrote what you said, and when i get a chance, i'll make some tutorials. I'm interested in that area too. Hi mate, any chance that this grass tutorial has been uploaded? If so where abouts will it be hosted? Could you also provide details on animating the grass with wind in the future? Currently i'm working on one music video, and i think it will be completly animated, i'll cover tutorials about animation too, probably it's going to be mostly about specifics. I'm especialy interested in this area as well. Most useful, thank you for sharing! Hi, My name fauzi, i was try to learn your tutorial but it's doesn't work when i try to follow. when i add particle in Circle object. the first i folow with render>choose object tab and the global paramter size 1,000 same like the tutorial. ucan she my picture in this link. 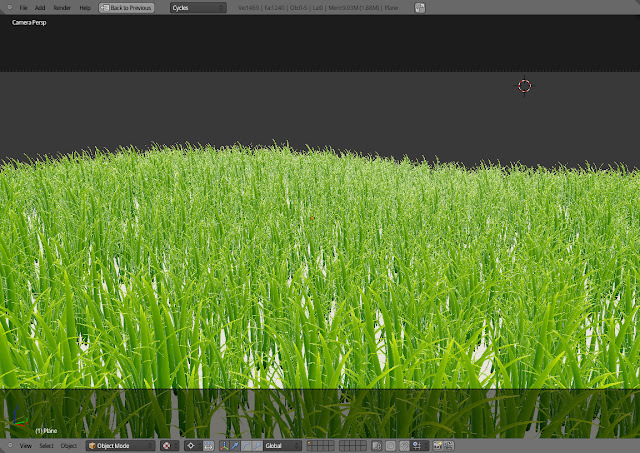 Hi Fauzi, i am familiar with this problem from earlier, and i think it has to do with scaling, just select original grass object and choose from menu object>apply>scale , then it should appear in regular proportions on surface you use as emitter. If this doesn't work, you can send me a .blend file, so i could take a closer look. 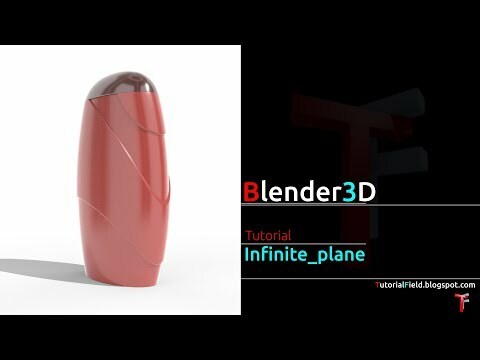 If this isn't solution, i would like to write an answer here so if any other blender user comes to a similar situation can find in here what is causing the problem.